It must be abundantly clear that the way to my heart is through my sweet tooth. Lo and behold another sweet treat was hand delivered to my doorstep a couple days ago in an amazon.com box. 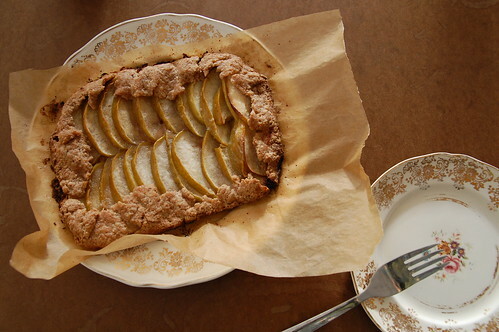 Not books, but a homemade apple tart made by Reva. Of course the best time to enjoy such things is for breakfast. Why stop there? 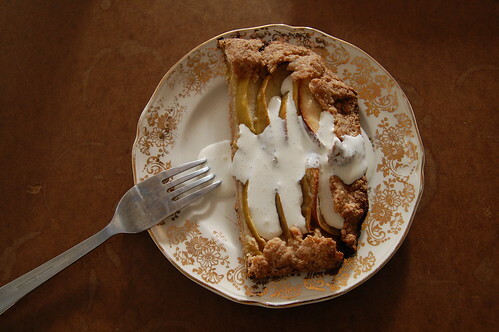 Why not add some cream with vanilla bean and raw sugar? Yes, thank you, I will! I don’t know about you but once I start looking at recipes, I can’t stop. I’ll pore through cookbooks and food blogs bookmarking dozens of recipes and making myself extremely hungry. It’s a strange form of torture. oh my goodness. that looks divine. and the plate that your treat is on is quite catching too! yummy! i have some saucers and teacups in the same pattern as your plate! Oh! New blog look — I like it! I am not so good with baking; I am forever messing things up (for example, the last time I made cupcakes I used sea salt instead of regular salt and yeah… totally inedible). I don’t think I mentioned this but I’ve added your mac & cheese (or rather Martha’s, but I give you the credit!) to the dinner repertoire! It’s so good! I think I’ve made it two or three times now, and I am particularly fond of the gruyere addition and of the crunchy breaded top. I love dishes that always result in leftovers! orangette – i love her site. i just discovered kale via it. it’s delicious. who knew! bobbinoggin – it was delicious and i even shared a bit with debbie. i’m notorious for gobbling up treats before anyone else can get a taste. shannon – i love this sweet china pattern. my mom gave them to me when i opened the shop. i feel so refined eating off them. anabela – the new blog look is having technical difficulties, but i’ll get back to it when i’ve got more time this weekend. i’m so happy to hear you’re enjoying the mac & cheese. the leftovers taste so good the next day. martina – i read that kale post, but now i’m intrigued to try it. did you use her recipe? so glad you liked it, karyn! it was fun to make. my plan for next time is pears. yum.